La Martina is a world leader in polo kit and clothing and has firmly establish its reputation by supporting the growth and popularity of polo at all levels through its sponsorship of more than 80 clubs and events globally. Nowhere is this more prevalent than at Guards Polo Club. 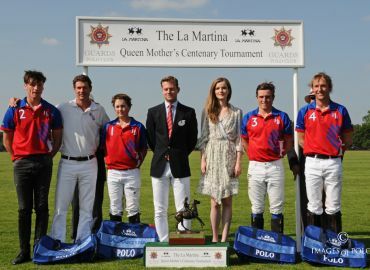 Not only is La Martina the title sponsor of the prestigious Varsity Day and the Queen Elizabeth The Queen Mother Centenary Trophy tournaments, but it also created the impressive Store at Smith's Lawn. The Store, managed by Becky Simpson and her team, offers a comprehensive collection of polo kit and clothing, including There is also a superb range of polo equipment and protective gear for both pony and player, including the Evolution helmet, carbon fibre reinforced elbow guards and La Martina's unique rubber-insert polo boots and kneepads. However this beautifully appointed, bright, light store, with its comfortable sofas, also boasts a wonderful collection of weekend clothing, including key items from the beautiful bespoke ‘Guards Polo Club Collection by La Martina’, as well as jackets, polos, jeans, fleeces and gillets. Perfect for everyone, whether you are player, patron or spectator. The Store is closed on Mondays. Although the Store is open on Bank Holidays when polo is played (and if it is open on Bank Holiday then it closes on Tuesday instead), and stays open until late on special event days.